A worker takes apart electronic components at a shop in the To Kwa Wan district of Hong Kong, Jan. 14, 2017. Hong Kong is about to open its first recycling plant specifically to process domestic electronic waste, which should help reduce water and soil pollution, but isn’t necessarily good news for e-waste traders. Around 70,000 metric tons of e-waste is generated annually in Hong Kong. The relatively high-quality products such as discarded refrigerators, smart phones and laptops are often sent to South Asia and Southeast Asia for refurbishment and reuse; low-quality scraps often end up exported to unofficial recycling centers in Asia and Africa. In fact, about 80 percent of the electronic waste created in Hong Kong is exported today, but that percentage could drop significantly starting this year when the recycling plant operated by Alba Integrated Waste Solutions (Hong Kong) Ltd., now undergoing final inspections, opens for business. Alba expects the facility to initially handle 30,000 metric tons of domestic e-waste annually, with the possibility of processing as much as 57,000 metric tons a year down the road, Nigel Mattravers, director and general manager, told Bloomberg BNA. Given how rapidly people in Hong Kong are buying new electronics and throwing away old ones, “Hong Kong could support more Albas,” Shegerian said. The government-sponsored recycling facility cost 550 million Hong Kong dollars ($70 million) to build. It’s part of Hong Kong’s “producer responsibility” policy, requiring retailers to take back end-of-life items from consumers. Retailers will provide information on the identities of licensed recyclers, largely “shutting off routes to private collectors,” Mattravers said. The goal is to establish a “closed-loop system” in which electronic items can be turned into useful resources, according to the Environmental Protection Department. At first, the Alba facility will handle domestically sold air conditioners, refrigerators, washing machines, televisions, computers, printers, scanners, and monitors. Alba has set up four locations for collecting the waste, with another planned, and stock has begun to pile up. A worker examines electronic appliances at a sorting plant in Sheung Shui in the New Territories in Hong Kong, on Jan. 13, 2017. The products at the Alba plant will be taken apart, stripped of toxics, and turned into secondary raw material such as plastics, copper, or iron, which can be reused for manufacture. Some products will be refurbished for low-income residents of Hong Kong, with a minimal amount shipped to landfills, according to Mattravers. Similar comprehensive e-waste recycling centers operate in other parts of the world, including Europe, the U.S., and Japan. While China has more than 100 “official recyclers” certified by the Ministry of Environmental Protection, where domestic e-waste is supposed to go to, it lacks a collection process like Hong Kong’s “producer responsibiliy” program. While the Alba facility targets domestically created e-waste, Hong Kong also imports a large amount of e-waste. Some of that has to do with its status as one of the world’s busiest ports: Shipping containers being brought back to Hong Kong from trips overseas are worth more to owners if they carry something that can be sold—even trash—than if they’re empty. The nongovernmental organization Basel Action Network has partnered with the Massachusetts Institute of Technology’s MIT Senseable City Laboratory to put location trackers into e-waste known to have U.S.-derived hazardous material. Of 65 trackers that left the U.S. in the first part of the program, 37 ended up in Hong Kong, Jim Puckett, the Basel Action Network’s executive director, told Bloomberg BNA. Another factor that has propelled Hong Kong’s e-waste import business in recent years is the actions of mainland China, which has limited how much such waste can come into its country. E-waste handling and disposal can have major environmental implications, with sometimes toxic substances entering the air if burned, and contaminating water and soil if discarded. Much of the imported e-waste arrives semi-sorted, so Hong Kong recyclers do fine-sorting and then start breaking things down into plastics, metals, and precious metals. Ironically, that scrap then often gets exported anew. 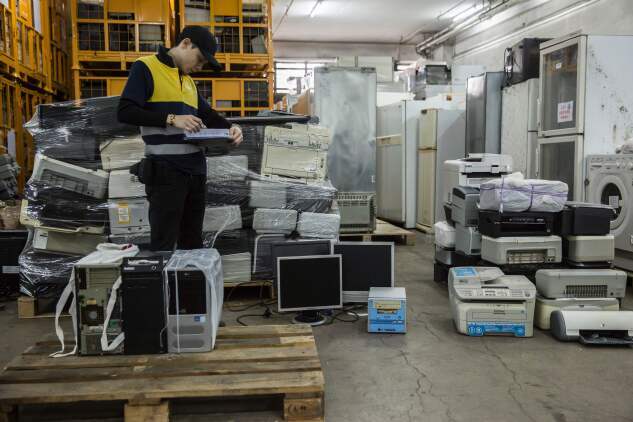 Hong Kong also has started enforcing licensing controls to require anyone storing, treating, reprocessing, or recycling e-waste to have a disposal license. The Hong Kong Recycling Chamber of Commerce has led protests against the licensing requirement, noting that to obtain a license, many recyclers would have to relocate to land zoned for industrial use. Many recyclers now have small workshops in agricultural lands in the northern New Territories area of Hong Kong, close to China, and can’t afford to move. Some 90 percent of the organization’s 500 members may have to close or start recycling materials not covered under the e-waste disposal rules once the licensing is required, Shirley Kwok, an adviser to the group, told Bloomberg BNA.